Seattle was once dubbed "America's greenest city" for leading the charge on climate change. But despite the hype we stubbornly can't seem to cut our own carbon footprint. Seattle is known far and wide for being green. But once again our actions haven’t quite lived up to the hype. Take the just-released accounting of the Emerald City’s collective carbon footprint. Every few years, the city does a sort of climate-change checkup, an inventory of the total greenhouse-gas emissions of Seattle’s cars, buildings and industry. Kudos to the authors. Because this time, they came right out with it. We’re not green. We’re failing. “In order to achieve our goal of Seattle becoming a carbon neutral city, we need to increase the pace of our emissions reductions by sevenfold,” the report says. Think about that. The city is only a few years in to a 15-year plan to cut carbon emissions roughly in half, by 2030. And already we’re lagging to such an extent that we need to go seven times faster? “Our overall emissions reductions are not on pace to meet our climate goals,” the report says. In fact, carbon emissions stubbornly have risen of late in Seattle — by about 7 percent since 2012. It’s the usual suspects — growth plus cars, as well as an incredible boom in airplane travel. We are jetting in and out of Sea-Tac so much that carbon emissions from our flights alone are up 37 percent since 2012. The report does note that Seattle’s carbon emissions have declined slightly on a per-person basis. That suggests some progress, although still not enough to meet the goals. 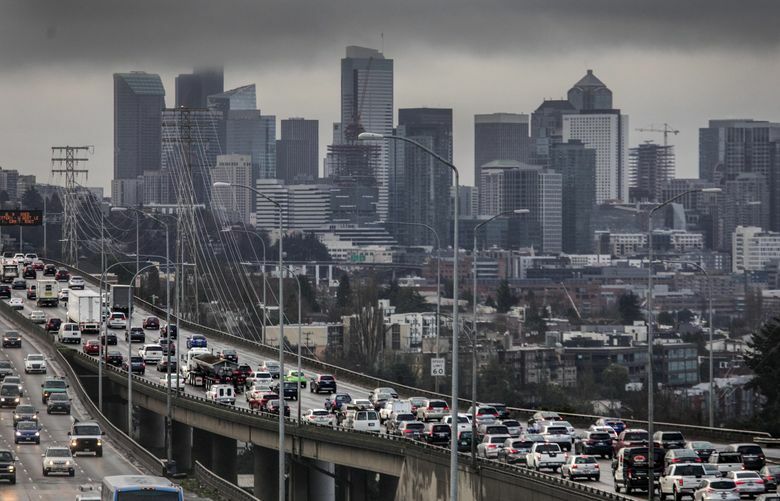 With Seattle booming, the urgency of climate change has been left in the gold-rush dust. This is becoming a trend. Remember when former Seattle Mayor Greg Nickels rallied cities to embrace the Kyoto global-warming protocol, because the federal government refused to do it? That effort won Nickels and Seattle lots of green cred. But then Seattle infamously failed to live up to it, as in the end we didn’t reduce carbon emissions below 1990 levels, as Kyoto had laid out. Years later, Seattle still hasn’t met those goals. The latest inventory shows Seattle sits at 3 percent above 1990 emissions levels. The latest figures for the state of Washington, released in January, are slightly worse, with the state at 8 percent above the 1990 levels. So neither the Emerald City nor the Evergreen State got green after all. Why not? Well there’s been the reluctance of the voters and the political system to do much about the issue in a big way. But there’s also the small, individual things. Reading the city’s carbon-footprint report, I realized it was basically describing me. Not only do I still drive to work in a gas-fueled car, but my family is on track to take a record number of flights this year. Start with aging parents in faraway places, add one kid in college out of state and another looking there, and all of a sudden we’re in frequent-flyer clubs on multiple airlines. I know from the report that I’m no outlier in this progressive utopia. My point is that if even the people who believe climate change is a serious problem are hypocrites and won’t change, then what hope is there? This is all a long way of explaining why I’m skeptical of the newest climate-change plan, the Green New Deal. I salute it for trying to make climate a hot topic. But to the extent it tries to get people to stop driving or flying or eating meat, or to pay significantly higher fuel taxes, it’s probably doomed. It isn’t just that Republicans will demonize it by braying about death panels or some such, although they will. It’s that our emissions don’t lie. We haven’t even been able to take these actions in Seattle, America’s greenest city. So what to do instead? The best idea came from our own Gov. Jay Inslee. Not recently, but 17 years ago, when he was a congressman, he proposed what he called a “New Apollo Project.” His idea then was simple: To convene the world’s best scientists and charge them not with taking a shot at the moon, but to design and invent a “a new energy future” to save the Earth. I don’t know: We humans seem immune to perseverance on this particular issue. It’s time to call in the geniuses.